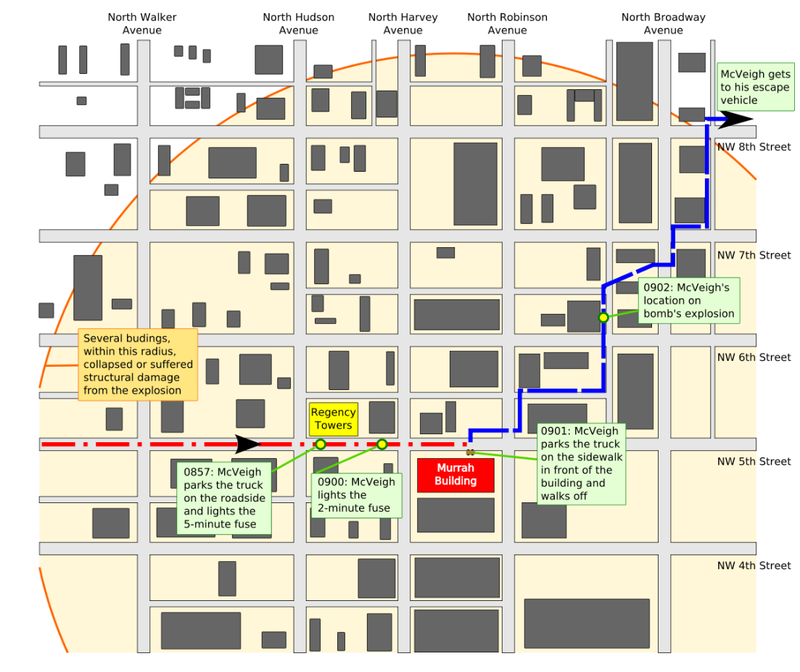 Map showing the layout of downtown Oklahoma City near the bombed building. The map uses simple shapes to identify some notable nearby buildings and roads. A large circle covers half the map, illustrating the extent of damage from the bomb. A red path shows the path McVeigh took to get to the building with the Ryder truck, and a blue line shows his escape on foot. 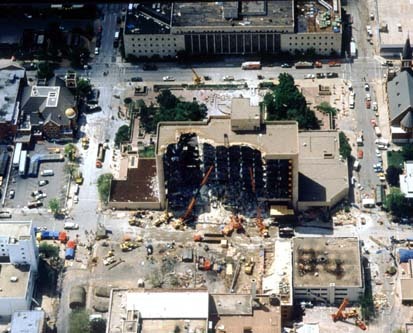 An overhead view shows the Alfred P. Murrah building, half of it destroyed from the bomb's blast. Near the building are various rescue vehicles and cranes. Some damage is visible to nearby buildings. McVeigh's later response to the range of casualties was: "I didn't define the rules of engagement in this conflict. The rules, if not written down, are defined by the aggressor. It was brutal, no holds barred. Women and kids were killed at Waco and Ruby Ridge. You put back in [the government's] faces exactly what they're giving out. "Good Night" (also known as "Good Night Simpsons" is the first of forty-eight Simpsons shorts that appeared on the variety show The Tracey Ullman Show. It originally aired on the Fox network in the United States on April 19, 1987, during the third episode of The Tracey Ullman Show and marks the first appearance of the Simpson family — Homer, Marge, Bart, Lisa, and Maggie — on television. After three seasons on Tracey Ullman, the shorts would be adapted into the animated show The Simpsons. "Good Night" has since been aired on the show in the episode "The Simpsons 138th Episode Spectacular" (in its entirety), along with several other Ullman shorts, and is one of the few shorts to ever be released on DVD, being included in the Season 1 DVD set. Homer and Marge say goodnight to their children, but all does not go according to plan. Bart tries to ask about the mind, but is left contemplating it as he does not get a proper answer. Lisa fears that bed bugs will eat her after hearing Marge say "Don't let the bed bugs bite". Maggie is terrified by the lyrics of "Rock-a-bye Baby". Ultimately, all of the three children decide to sleep in the parents' bed. Groening first conceived of the Simpsons in the lobby of James L. Brooks' office. He had been called in to pitch a series of animated shorts, and had intended to present his Life in Hell series. When he realized that animating Life in Hell would require him to rescind publication rights for his life's work, Groening decided to go in another direction. He hurriedly sketched out his version of a dysfunctional family, and named the characters after his own family. Bart was modeled after Groening's older brother, Mark, but given a different name which was chosen as an anagram of "brat." This short was written and storyboarded by Groening. The family was crudely drawn, because Groening had submitted basic sketches to the animators, assuming they would clean them up; instead they just traced over his drawings. The animation was produced at Klasky Csupo, with Wesley Archer, David Silverman, and Bill Kopp being animators. Despite later making the decision for Maggie to not speak throughout the show's run, Maggie does say the words 'good night'. While Yeardley Smith does Maggie's babbling in the show, her speaking bits in this short were done by Liz Georges. The Simpsons Archive suggests that Gabor Csupo did the pacifier sucking noises, as opposed to Matt Groening who did the role later. At this point in time, the characters were very different from how they would be in the first season of The Simpsons and beyond. In addition to this, Homer was smarter than portrayed later and spoke in a Walter Matthau-style voice. Lisa misbehaved as much as Bart. FilmThreat says "This dark nursery rhyme is funny and disturbing. Homer’s voice is totally off the wall, nothing like it stands today, and it’s interesting to see how far they’ve come since these early forays into animation". Todd Doogan of The Digital Bits was sad that "only [one] of the original Tracey Ullman Show shorts" was featured on the first season DVD". He added, "Still, the one you gets perfectly illustrates just how far the show has come". DVD.net describes it as "The Simpsons as some of you may never have seen before, drawn by the hand of Matt Groening himself and looking a little worse for wear." DVD Movie Guide says, "I’ve seen a few additional Ullman shorts and think they’re nearly unwatchable, so I can’t say I miss them, at least not for their entertainment value. However, they’d make a nice historical addition, so it’s too bad we only get this single clip. 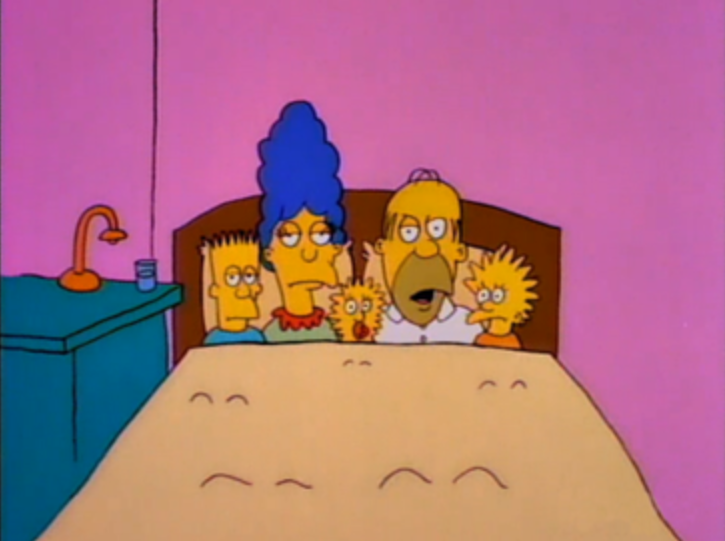 The first one ever aired, “Good Night Simpsons” runs for 115 unfunny seconds." The Digital Fix says the short extra on the DVD "showcases the superb sense of humour that has made The Simpsons what it is today", and that "the picture quality is quite breathtaking (considering the age of these shorts) while the sound is standard DD2.0 Stereo". It adds that "it is a teaser for something we will supposedly never see (all 48 shorts on DVD)" and wishes they had chosen a short that hadn't been featured in a future episode (The 138th Episode Spectacular), and therefore released on the Season 7 Box set. Planet Simpson says "the drawing and animation were blatantly crude, thick-lined, and primary-colored" and that "the vignettes were far too short for anything as sophisticated as 'character development'". It adds that the "central gag [of] kids finding ironic horror in bedtime platitudes" was very simplistic, and doubts many people even watched the airing of the short. However, the book explains the significance of Good Night as "the first baby steps of an institution that would become one of the most-watched TV shows on earth and the most influential cultural enterprise of its time". On 19 April 1989, the Number Two 16-inch gun turret of the United States Navy battleship USS Iowa (BB-61) exploded. The explosion in the center gun room killed 47 of the turret's crewmen and severely damaged the gun turret itself. Two major investigations were undertaken into the cause of the explosion, one by the U.S. Navy and then one by the Government Accountability Office (GAO) and Sandia National Laboratories. The investigations produced conflicting conclusions. The first investigation into the explosion, conducted by the U.S. Navy, concluded that one of the gun turret crew members, Clayton Hartwig, who died in the explosion, had deliberately caused it. During the investigation, numerous leaks to the media, later attributed to U.S. Navy officers and investigators, implied that Hartwig and another sailor, Kendall Truitt, had engaged in a homosexual relationship and that Hartwig had caused the explosion after their relationship had soured. In its report, however, the U.S. Navy concluded that the evidence did not show that Hartwig was homosexual but that he was suicidal and had caused the explosion with either an electronic or chemical detonator. The victims' families, the media, and members of the U.S. Congress were sharply critical of the U.S. Navy's findings. The U.S. Senate and U.S. House Armed Services Committees both held hearings to inquire into the Navy's investigation and later released reports disputing the U.S. Navy's conclusions. The Senate committee asked the GAO to review the U.S. Navy's investigation. To assist the GAO, Sandia National Laboratories provided a team of scientists to review the Navy's technical investigation. During its review, Sandia determined that a significant overram of the powder bags into the gun had occurred as it was being loaded and that the overram could have caused the explosion. A subsequent test by the Navy of the overram scenario confirmed that an overram could have caused an explosion in the gun breech. Sandia's technicians also found that the physical evidence did not support the U.S. Navy's theory that an electronic or chemical detonator had been used to initiate the explosion. In response to the new findings, the U.S. Navy, with Sandia's assistance, reopened the investigation. In August 1991, Sandia and the GAO completed their reports, concluding that the explosion was likely caused by an accidental overram of powder bags into the breech of the 16-inch gun. The U.S. Navy, however, disagreed with Sandia's opinion and concluded that the cause of the explosion could not be determined. The U.S. Navy expressed regret (but did not offer apology) to Hartwig's family and closed its investigation. On 10 April the battleship was visited by commander of the US 2nd Fleet, Vice Admiral Jerome L. Johnson, and on 13 April Iowa sailed from Norfolk to participate in a fleet exercise in the Caribbean Sea near Puerto Rico. The exercise, titled "FLEETEX 3-89", began on or around 17 April under Johnson's command. Iowa served as Johnson's flagship during the exercise. Throughout the night of 18 April, Turret Two's crew conducted a major overhaul of their turret in preparation for a firing exercise scheduled to take place the next day. The center gun's compressed air system, which cleansed the bore of sparks and debris each time the gun was fired, was not operating properly. Also on 18 April, Iowa's fire-control officer, Lieutenant Leo Walsh, conducted a briefing to discuss the next day's main battery exercise. Moosally, Morse, Kissinger, and Costigan did not attend the briefing. During the briefing, Skelley announced that Turret Two would participate in an experiment of his design in which D-846 powder would be used to fire 2700 lb (1224.7 kg) shells. The powder lots of D-846 were among the oldest on board Iowa, dating back to 1943–1945, and were designed to fire 1900 lb (861.8 kg) shells. In fact, printed on each D-846 powder canister were the words, "WARNING: Do Not Use with 2,700-pound projectiles." D-846 powder burned faster than normal powder, which meant that it exerted greater pressure on the shell when fired. Skelley explained that the experiment's purpose was to improve the accuracy of the guns. Skelley's plan was for Turret Two to fire ten 2,700-pound practice (no explosives) projectiles, two from the left gun and four rounds each from the center and right guns. Each shot was to use five bags of D-846, instead of the six bags normally used, and to fire at the empty ocean 17 nautical miles (20 mi; 30 km) away. Ziegler was especially concerned about his center gun crew. The rammerman, Robert W. Backherms, was inexperienced, as were the powder car operator, Gary J. Fisk, the primerman, Reginald L. Johnson Jr., and the gun captain, Richard Errick Lawrence. To help supervise Lawrence, Ziegler assigned Gunner's Mate Second Class Clayton Hartwig, the former center gun captain, who had been excused from gun turret duty because of a pending reassignment to a new duty station in London, to the center gun's crew for the firing exercise. Because of the late hour, Ziegler did not inform Hartwig of his assignment until the morning of 19 April, shortly before the firing exercise was scheduled to begin. The rammerman's position was of special concern, as ramming was considered the most dangerous part of loading the gun. The ram was used to first thrust the projectile and then the powder bags into the gun's breech. The ram speed used for the projectile was much faster (14 feet (4.3 m) per second) than that used for the lighter powder bags (1.5 feet (0.46 m) per second), but there was no safety device on the ram piston to prevent the rammerman from accidentally pushing the powder bags at the faster speed. Overramming the powder bags into the gun could subject the highly flammable powder to excessive friction and compression, with a resulting increased danger of premature combustion. Also, if the bags were pushed too far into the gun, a gap between the last bag and the primer might prevent the powder from igniting when the gun was fired, causing a misfire. None of Iowa's rammermen had any training or experience in ramming nonstandard five-bag loads into the guns. Complicating the task, as the rammerman was shoving the powder bags, he was also supposed to simultaneously operate a lever to shut the powder hoist door and lower the powder hoist car. Iowa crewmen later stated that Turret Two's center gun rammer would sometimes "take off" uncontrollably on its own at high speed. Furthermore, Backherms had never operated the ram before during a live fire shoot. At 08:31 on 19 April, the main turret crewmembers were ordered to their stations in Turrets One, Two, and Three. Thirty minutes later the turrets reported that they were manned, swiveled to starboard in firing position, and ready to begin the drill. Vice Admiral Johnson and his staff entered the bridge to watch the firing exercise. Iowa was 260 nautical miles (300 mi; 480 km) northeast of Puerto Rico, steaming at 15 knots (17 mph; 28 km/h). Turret One fired first, beginning at 09:33. Turret One's left gun misfired and its crew was unable to get the gun to discharge. Moosally ordered Turret Two to load and fire a three-gun salvo. According to standard procedure, the misfire in Turret One should have been resolved first before proceeding further with the exercise. Forty-four seconds after Moosally's order, Lieutenant Buch reported that Turret Two's right gun was loaded and ready to fire. Seventeen seconds later, he reported that the left gun was ready. A few seconds later, Errick Lawrence, in Turret Two's center gun room, reported to Ziegler over the turret's phone circuit that, "We have a problem here. We are not ready yet. We have a problem here." Ziegler responded by announcing over the turret's phone circuit, "Left gun loaded, good job. Center gun is having a little trouble. We'll straighten that out." Mortensen, monitoring Turret Two's phone circuit from his position in Turret One, heard Buch confirm that the left and right guns were loaded. Lawrence then called out, "I'm not ready yet! I'm not ready yet!" Next, Ernie Hanyecz, Turret Two's leading petty officer suddenly called out, "Mort! Mort! Mort!" Ziegler shouted, "Oh, my God! The powder is smoldering!" At this time, Ziegler may have opened the door from the turret officer's booth in the rear of the turret into the center gun room and yelled at the crew to get the breech closed. About this same time, Hanyecz yelled over the phone circuit, "Oh, my God! There's a flash!" Iowa's Number Two turret is cooled with sea water shortly after exploding. At 09:53, about 81 seconds after Moosally's order to load and 20 seconds after the left gun had reported loaded and ready, Turret Two's center gun exploded. A fireball between 2,500 and 3,000 °F (1,400 and 1,600 °C) and traveling at 2,000 feet per second (610 m/s) with a pressure of 4,000 pounds-force per square inch (28 MPa) blew out from the center gun's open breech. The explosion caved in the door between the center gun room and the turret officer's booth and buckled the bulkheads separating the center gun room from the left and right gun rooms. The fireball spread through all three gun rooms and through much of the lower levels of the turret. The resulting fire released toxic gases, including cyanide gas from burning polyurethane foam, which filled the turret. Shortly after the initial explosion, the heat and fire ignited 2,000 pounds (910 kg) of powder bags in the powder-handling area of the turret. Nine minutes later, another explosion, most likely caused by a buildup of carbon monoxide gas, occurred. All 47 crewmen inside the turret were killed. The turret contained most of the force of the explosion. Twelve crewmen working in or near the turret's powder magazine and annular spaces, located adjacent to the bottom of the turret, were able to escape without serious injury. These men were protected by blast doors which separate the magazine spaces from the rest of the turret. Firefighting crews quickly responded and sprayed the roof of the turret and left and right gun barrels, which were still loaded, with water. Meyer and Kissinger, wearing gas masks, descended below decks and inspected the powder flats in the turret, noting that the metal walls of the turret flats surrounding several tons of unexploded powder bags in the turret were now "glowing a bright cherry red". Meyer and Kissinger were accompanied by Gunner's Mate Third Class Noah Melendez in their inspection of the turret. On Kissinger's recommendation, Moosally ordered Turret Two's magazines, annular spaces, and powder flats flooded with seawater, preventing the remaining powder from exploding. The turret fire was extinguished in about 90 minutes. Brian Scanio was the first fireman to enter the burning turret, followed soon after by Robert O. Shepherd, Ronald G. Robb, and Thad W. Harms. The firemen deployed hoses inside the turret. After the fire was extinguished, Mortensen entered the turret to help identify the bodies of the dead crewmen. Mortensen found Hartwig's body, which he identified by a distinctive tattoo on the upper left arm, at the bottom of the 20-foot (6.1 m) deep center gun pit instead of in the gun room. His body was missing his lower forearms, legs below the knees, and was partially, but not badly, charred. The gas ejection air valve for the center gun was located at the bottom of the pit, leading Mortensen to believe that Hartwig had been sent into the pit to turn it on before the explosion occurred. Mortensen also found that the center gun's powder hoist had not been lowered, which was unusual since the hoist door was closed and locked. Navy pallbearers, attended by an honor guard, carry the remains of one of the victims from the turret explosion after its arrival at Dover Air Force Base on 20 April 1989. After most of the water was pumped out, the bodies in the turret were removed without noting or photographing their locations. The next day, the bodies were flown from the ship by helicopter to Roosevelt Roads Naval Station, Puerto Rico. From there, they were flown on a United States Air Force C-5 Galaxy transport aircraft to the Charles C. Carson Center for Mortuary Affairs at Dover Air Force Base, Delaware. Meyer made a rudimentary sketch of the locations of the bodies in the turret which would later contradict some of the findings in the U.S. Navy's initial investigation. With assistance from the Federal Bureau of Investigation (FBI), the U.S. Navy was able to complete identification of all 47 sets of remains on 16 May 1989. Contradicting FBI records, the U.S. Navy would insist that all the remains had been identified by 24 April 1989, when all of the bodies were released to the families. The FBI cut the fingers off the unidentified corpses to identify them later. Body parts which had not been matched to torsos were discarded. Many of the remains were released to family members for burial before they were positively identified. Most of the bodies recovered from the center gun and turret officer's booth were badly burned and in pieces, making identification difficult. The bodies discovered lower in the turret were mostly intact; those crewmen had apparently died from suffocation, poisonous gases, or from impact trauma after being thrown around by the explosion. An explosive ordnance disposal technician, Operations Specialist First Class James Bennett Drake, from the nearby USS Coral Sea was sent to Iowa to assist in unloading the powder in Turret Two's left and right guns. After observing the scene in the center gun room and asking some questions, Drake told Iowa crewmen that, "It's my opinion that the explosion started in the center gun room caused by compressing the powder bags against the sixteen-inch shell too far and too fast with the rammer arm". Drake also helped Mortensen unload the powder from Turret One's left gun. When Turret One's left gun's breech was opened, it was discovered that the bottom powder bag was turned sideways. The projectile in Turret One's left gun was left in place and was eventually fired four months later. Morse directed a cleanup crew, supervised by Lieutenant Commander Bob Holman, to make Turret Two "look as normal as possible". Over the next day, the crew swept, cleaned, and painted the inside of the turret. Loose or damaged equipment was tossed into the ocean. No attempt was made to record the locations or conditions of damaged equipment in the turret. "No one was preserving the evidence," said Brian R. Scanio, a fireman present at the scene. A team of Naval Investigative Service (NIS) investigators (the predecessor of the Naval Criminal Investigative Service or NCIS) stationed nearby on the aircraft carrier Coral Sea was told that their services in investigating Iowa's mishap were not needed. At the same time, Moosally called a meeting with all of his officers, except Meyer, who was working in Turret One, in the ship's wardroom. At the meeting, Iowa's legal officer, Lieutenant Commander Richard Bagley, instructed the ship's officers on how to limit their testimony during the forthcoming investigation into the explosion. Terry McGinn, who was present at the meeting, stated later that Bagley "told everybody what to say. It was a party line pure and simple". On 23 April Iowa returned to Norfolk, where a memorial service was held on 24 April. Several thousand people, including family members of many of the victims, attended the ceremony at which President George H. W. Bush spoke. During his speech, Bush stated, "I promise you today, we will find out 'why,' the circumstances of this tragedy." In a press conference after the ceremony, Moosally said that the two legalmen killed in the turret were assigned there as "observers". He also claimed that everyone in the turret was qualified for the position that they were filling. Shortly after the memorial service at Norfolk on 24 April, Kendall Truitt told Hartwig's family that Hartwig had taken out a $50,000 double indemnity life insurance policy on himself and named Truitt as the sole beneficiary. Truitt was a friend of Hartwig's and had been working in Turret Two's powder magazine at the time of the explosion, but had escaped without serious injury. Truitt promised to give the life insurance money to Hartwig's parents. Unsure if she could trust Truitt, Kathy Kubicina, Hartwig's sister, mailed letters on 4 May to Moosally, Morse, Costigan, Iowa's Chaplain Lieutenant Commander James Danner, and to Ohio Senators Howard Metzenbaum and John Glenn in which she described the life insurance policy. She asked that someone talk to Truitt to convince him to give the money to Hartwig's parents. On 15 July 1989 Milligan submitted his completed report on the explosion to his chain of command. The 60-page report found that the explosion was a deliberate act "most probably" committed by Hartwig using an electronic timer. The report concluded that the powder bags had been overrammed into the center gun by 21 inches (53 cm), but had been done so under Hartwig's direction in order to trigger the explosive timer that he had placed between two of the powder bags. Donnell, on 28 July, endorsed Milligan's report, saying that the determination that Hartwig had sabotaged the gun "leaves the reader incredulous, yet the opinion is supported by facts and analysis from which it flows logically and inevitably". Donnell's superior, Atlantic Fleet Commander Admiral Powell F. Carter, Jr., then endorsed the report, adding that the report showed that there were "substantial and serious failures by Moosally and Morse", and forwarded the report to the CNO, Carlisle Trost. Although Miceli had just announced that test results at Dahlgren showed that an electronic timer had not caused the explosion, Trost endorsed the report on 31 August, stating that Hartwig was "the individual who had motive, knowledge, and physical position within the turret gun room to place a device in the powder train". Trost's endorsement cited Smith's statement to the NIS as further evidence that Hartwig was the culprit. Milligan's report was not changed to reflect Miceli's new theory that a chemical igniter, not an electrical timer, had been used to initiate the explosion. On 7 September, Milligan and Edney formally briefed media representatives at the Pentagon on the results of Milligan's investigation. Edney denied that the Navy had leaked any details about the investigation to the press. Milligan stated that the Navy believed Hartwig had caused the explosion, citing, among other evidence, the FBI's equivocal death analysis on Hartwig. Milligan displayed two books, Getting Even and Improvised Munitions Handbook, which he said belonged to Hartwig and provided "explicit" instructions on how to construct detonators and bombs. Milligan and Edney said that there was no proof that Hartwig was homosexual. Edney then stated that the investigation had proved that the Iowa-class battleships were safe to operate and that the powder in use on the ships "is stable and ready to use". Most of the victims' family members criticized the Navy's conclusions. Many of the families told media representatives of private misgivings that the victims had expressed to them about problems with training and the dangerous gunfire experiments occurring on Iowa before the explosion. Hartwig's family disputed the allegations that he was depressed and suicidal. Several journalists immediately began questioning the results of Milligan's investigation. John Hall, a reporter for the Richmond Times-Dispatch, wrote a series of four articles beginning on 17 September that revealed that Iowa was engaged in illegal powder experiments when the gun blew up; that conflicts of interest were evident in the investigators assigned to the inquiry; that many of the ship's crew were improperly or inadequately trained; and that evidence did not support the Navy's theory that Hartwig caused the explosion. The Associated Press picked up Hall's story and it was run in other newspapers throughout the United States. Robert Becker and A. J. Plunkett from the Daily Press wrote a lengthy story which criticized Milligan's report in detail. ABC reporter Robert Zelnick wrote an op-ed piece, which ran in The New York Times on 11 September, heavily criticizing the Navy for, in Zelnick's words, "scapegoating a dead seaman." Television newsmagazines 20/20 and 60 Minutes both ran stories questioning the Navy's conclusions. The Washington Post, in contrast, ran a story by George Wilson that generally supported the Navy's findings. On 3 October, Donnell disciplined Iowa's officers in response to findings in Milligan's report. Moosally and Bob Finney, Iowa's operations officer, were given nonpunitive "letters of admonition" which were not placed in their permanent personnel records. Kissinger and Skelley received punitive letters of admonition which were placed in their records, as well as fines of $2,000 and $1,000 respectively. Donnell suspended both fines. Shortly thereafter, the Navy issued a statement explaining that the safety violations and training deficiencies found aboard Iowa during the investigation were unrelated to the explosion. Two weeks later, a panel of thirteen admirals recommended that Moosally be given another major command, stating that Moosally was "superbly fit" for such responsibility. Milligan was one of the admirals on the panel who supported the recommendation. After 60 Minutes producer Charles Thompson asked Brent Baker and Chief of Naval Personnel Jeremy Michael Boorda about the recommendation, Moosally's name was withdrawn. At 07:38 on the morning of 18 April, while the task force was still about 650 nautical miles (1,200 km; 750 mi) from Japan (around 35°N 154°E), it was sighted by the Japanese picket boat No. 23 Nittō Maru, a 70-ton patrol craft, which radioed an attack warning to Japan. The boat was sunk by gunfire from USS Nashville. The chief petty officer who captained the boat killed himself rather than be captured, but five of the 11 crew were picked up by Nashville. Doolittle and Hornet skipper Captain Marc Mitscher decided to launch the B-25s immediately—10 hours early and 170 nautical miles (310 km; 200 mi) farther from Japan than planned. After respotting to allow for engine start and runups, Doolittle's aircraft had 467 feet (142 m) of takeoff distance. 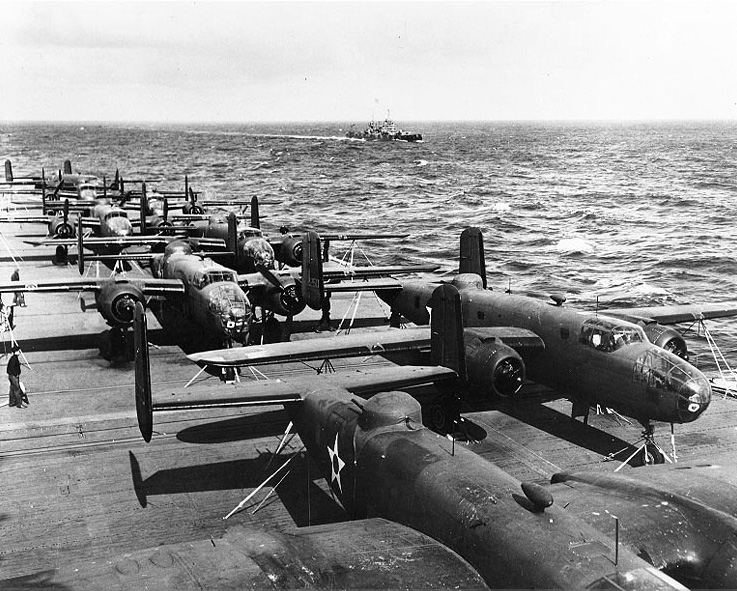 Although none of the B-25 pilots, including Doolittle, had ever taken off from a carrier before, all 16 aircraft launched safely between 08:20 and 09:19. The B-25s then flew toward Japan, most in groups of two to four aircraft, before flying singly at wave-top level to avoid detection. On April 17, 2013, an ammonium nitrate explosion occurred at the West Fertilizer Company storage and distribution facility in West, Texas, eighteen miles (29 km) north of Waco, while emergency services personnel were responding to a fire at the facility. Fifteen people were killed, more than 160 were injured, and more than 150 buildings were damaged or destroyed. Investigators have confirmed that ammonium nitrate was the material that exploded. On May 11, 2016, the Bureau of Alcohol, Tobacco, Firearms and Explosives stated that the fire had been deliberately set. West Fertilizer Company had supplied chemicals to farmers since it was founded in 1962. As of 2013 it was owned by Adair Grain, Inc. and employed nine workers at the facility. Adair Grain, Inc. is wholly owned by Donald Adair and his wife Wanda. At the time of the incident, the Occupational Safety and Health Administration (OSHA) had last inspected the plant in 1985. According to records obtained by the Associated Press, OSHA cited the plant for improper storage of anhydrous ammonia and fined it $30. OSHA could have fined the company as much as $1,000. OSHA also cited the plant for violations of respiratory protection standards, but did not impose a fine. OSHA officials said the facility was not on their "National Emphasis Plan" for inspections, because it was not a manufacturer, had no record of a major accident, and the Environmental Protection Agency did not consider it a major risk. After a complaint in 2006 about an ammonia smell coming from the facility, the Texas Commission on Environmental Quality investigated and cited the operator for not having a permit for two storage tanks that contained anhydrous ammonia. A permit was issued once the operators brought the facility into accord with agency regulations and recommendations. Also in 2006, the EPA fined the owners $2,300 for problems that included not filing a risk management program plan on time. In June 2012, the U.S. Department of Transportation's Pipeline and Hazardous Materials Safety Administration further fined the facility $5,250 for violations regarding anhydrous ammonia storage. According to an open records request by Reuters, the plant had a long history of minor thefts, presumably by people wanting to use anhydrous ammonia to make methamphetamine. The facility lacked burglar alarms, or even a fenced perimeter. It installed a surveillance system in 2009 after law enforcement recommended they do so. In an emergency planning report filed with the EPA in 2011, company officials said the ammonia storage tanks did not represent a significant fire or explosion hazard. The tanks were still intact following the fire and explosion. According to its last filing with the EPA in late 2012, the company stated that it stored 540,000 pounds (270 short tons; 240 t) of ammonium nitrate and 110,000 pounds (55 short tons; 50 t) of anhydrous ammonia on the site. A week after the explosion, Homeland Security Secretary Janet Napolitano told Senate investigators that the company did not appear to have disclosed its ammonium nitrate stock to her department. Federal law requires that the Department of Homeland Security (DHS) be notified whenever anyone has more than one ton of ammonium nitrate on hand, or 400 pounds (180 kg) if the ammonium nitrate is combined with combustible material. The facility caught fire on Wednesday, April 17, 2013, and roughly 20 minutes after the fire was first reported to emergency dispatchers the site exploded. At 7:50:38 p.m. CDT (00:50 UTC, April 18), as firefighters were attempting to douse the flames, it exploded with the force of 7.5-10 tons of TNT. The explosion created a 93 foot wide crater where the site of the fertilizer plant had previously been, and resulted in 12 deaths and numerous injuries. After weeks of investigation, the cause of the initial fire remained unknown; authorities ruled out weather, natural causes, anhydrous ammonia, and ammonium nitrate in a rail car as possible causes. In May 2016, the ATF announced that they had determined the fire had been deliberately set. The massive explosion obliterated the West Fertilizer Company plant and caused heavy damage and further destruction to surrounding areas. Numbers for people dead or injured varied initially. In addition to the obliterated plant, the damaged buildings included the public West Middle School, which sits next to the facility. A neighboring 50-unit, two-story apartment building was destroyed. The blast damaged the nearby West Rest Haven nursing home, and many residents were evacuated. Many of the nursing home residents received cuts from flying glass, but emergency personnel on scene judged that most of these injuries were not life-threatening. On April 20, some residents who tried to return to their destroyed homes were turned away, because leaking gas tanks were causing small fires. According to the company's insurer, United States Fire Insurance of Morristown, New Jersey, the facility was only covered by $1 million in liability insurance. According to official estimates from both state and company officials, this amount did not even begin to cover the cost of damages. Furthermore, according to The Dallas Morning News, Texas law allows fertilizer storage facilities to operate without any liability insurance at all, even when they store hazardous materials. West Mayor Tommy Muska told the Waco Tribune-Herald that as of late evening, April 17, six or seven volunteer firefighters from the city were unaccounted for. West EMS Director Dr. George Smith, himself injured, said he believed at least two emergency responders were killed. "We do have confirmed fatalities," Texas Department of Public Safety spokesman D.L. Wilson said at a midnight news conference on April 17. "We have a tremendous amount of injuries ... over 100 injuries at this time." Wilson did not confirm or deny an earlier report that the number of deaths could be in the range of 60 to 70. 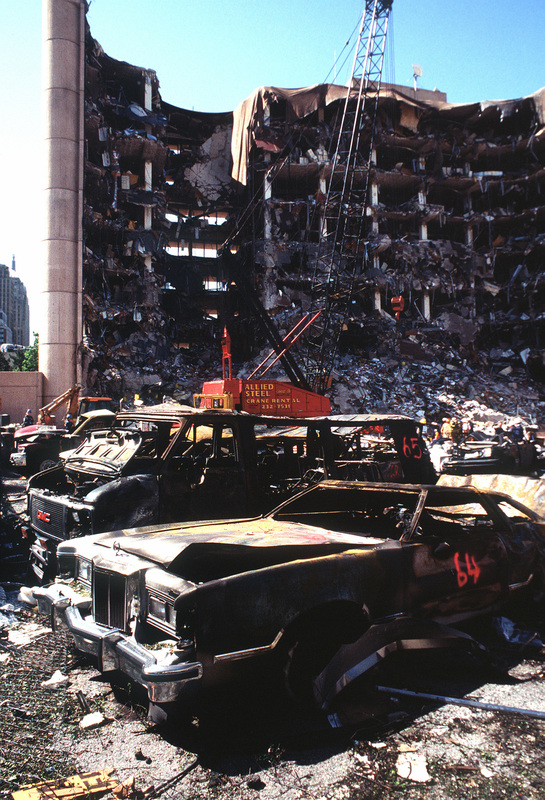 He said the blast zone was "just like the Murrah Building in Oklahoma City," comparing its effects to the Oklahoma City bombing, and that "50 to 75" homes and businesses were damaged. Sergeant William Patrick Swanton of the Waco Police Department said the operation has gone into a "search-and-rescue mode", aiming to find survivors and recover those who might be trapped in buildings. He said at least 160 people had been injured, and the firefighters who were combating the initial fire were still unaccounted for. Swanton quoted local environmental officials and emergency personnel in saying there was no risk to the community from the smoke fumes rising from the facility. Over 100 people were reported injured in the blast, and were originally transported to a makeshift triage set up at West High School's football field. It was later moved to a community center due to its proximity to the still-burning facility. Hillcrest Baptist Medical Center in Waco received over 40 injured for treatment. Patients were also admitted to Waco's Providence Healthcare Network, Fort Worth's John Peter Smith Health Network, Dallas's Parkland Memorial Hospital, and Temple's Scott and White Memorial Hospital. Authorities announced on April 19 that twelve bodies had been recovered, sixty people were missing, and at least 200 had been injured. The twelve dead included ten first responders as well as two civilians who had volunteered to fight the fire. The final confirmed death toll was fifteen fatalities, and approximately 160 to 200 people were injured. I didn't realize that the West, TX explosion took place a day after the 66th anniversary of the Texas City Disaster. The Texas City disaster was an industrial accident that occurred April 16, 1947 in the Port of Texas City, Texas. It was the deadliest industrial accident in U.S. history, and one of history's largest non-nuclear explosions. Originating with a mid-morning fire on board the French-registered vessel SS Grandcamp (docked in the port), her cargo of approximately 2,200 tons (approximately 2,100 metric tons) of ammonium nitrate detonated, initiating a subsequent chain-reaction of additional fires and explosions in other ships and nearby oil-storage facilities. It killed at least 581 people, including all but one member of the Texas City fire department. The disaster triggered the first ever class action lawsuit against the United States government, under the then-recently enacted Federal Tort Claims Act (FTCA), on behalf of 8,485 victims. The ammonium nitrate, needed either as fertilizer or an explosive, was manufactured in Nebraska and Iowa and shipped to Texas City by rail before being loaded on the Grandcamp. It was manufactured in a patented process, mixed with clay, petrolatum, rosin and paraffin wax to avoid moisture caking. It was also packaged in paper sacks, then transported and stored at temperatures that increased its chemical activity. Longshoremen reported the bags were warm to the touch before loading. Shortly before 9:00 a.m., the captain ordered his men to steam the hold, a firefighting method where steam is piped in to extinguish fires, to preserve the cargo. This was unlikely to be effective, as ammonium nitrate produces its own oxygen, thus neutralizing the extinguishing properties of steam. The steam may have contributed to the fire by converting the ammonium nitrate to nitrous oxide, while augmenting the already intense heat in the ship's hold. At 9:12 a.m., the ammonium nitrate reached an explosive threshold from the combination of heat and pressure. The vessel then detonated, causing great destruction and damage throughout the port. The tremendous blast sent a 15-foot (4.5 m) wave that was detectable nearly 100 miles (160 km) off the Texas shoreline. The blast leveled nearly 1,000 buildings on land. The Grandcamp explosion destroyed the Monsanto Chemical Company plant and resulted in ignition of refineries and chemical tanks on the waterfront. Falling bales of burning twine from the ship's cargo added to the damage while the Grandcamp's anchor was hurled across the city. Two sightseeing airplanes flying nearby had their wings shorn off, forcing them out of the sky. 10 miles (16 km) away, half of the windows in Galveston were shattered. The explosion blew almost 6,350 short tons (5,760 metric tons) of the ship's steel into the air, some at supersonic speed. Official casualty estimates came to a total of 567, including all the crewmen who remained aboard the Grandcamp. All but one member of the 28-man Texas City volunteer fire department were killed in the initial explosion on the docks while fighting the shipboard fire. With fires raging throughout Texas City, first responders from other areas were initially unable to reach the site of the disaster. The first explosion ignited ammonium nitrate in the nearby cargo ship High Flyer. The crews spent hours attempting to cut the High Flyer free from her anchor and other obstacles, without success. 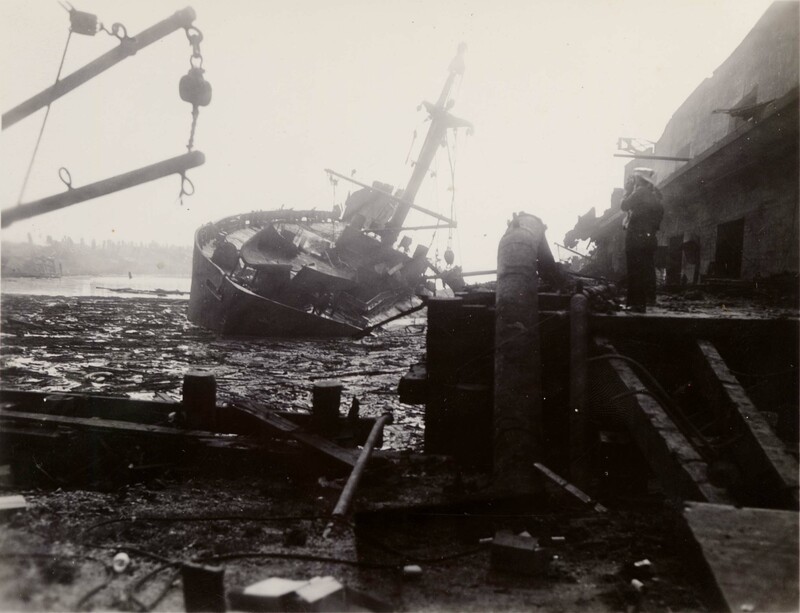 After smoke had been pouring from the hold for over five hours, and about 15 hours after the explosions aboard the Grandcamp, the High Flyer exploded, demolishing the nearby SS Wilson B. Keene, killing at least two more and increasing the damage to the port and other ships with more shrapnel and burning material. One of the propellers on the High Flyer was blown off and subsequently found nearly a mile inland. It is now part of a memorial park and sits near the anchor of the Grandcamp. The propeller is cracked in several places, and one blade has a large piece missing. The cause of the initial fire on board the Grandcamp was never determined, but it may have been started by a cigarette discarded the previous day, meaning the ship's cargo had been smouldering throughout the night when it was discovered on the morning of the day of the explosion. The Texas City disaster is generally considered the worst industrial accident in American history. Witnesses compared the scene to the fairly recent images of the 1943 air raid on Bari and the much larger devastation at Nagasaki. Of the dead, 405 were identified and 63 have never been identified. These were placed in a memorial cemetery in the north part of Texas City near Moses Lake. An additional 113 people were classified as missing, for no identifiable parts were ever found. This figure includes firefighters who were aboard Grandcamp when she exploded. There is some speculation that there may have been hundreds more killed but uncounted, including visiting seamen, non-census laborers and their families, and an untold number of travelers. However, there were some survivors as close as 70 feet (21 m) from the dock. The victims' bodies quickly filled the local morgue, and several bodies were laid out in the local high school's gymnasium for identification by loved ones. More than 5,000 people were injured, with 1,784 admitted to 21 area hospitals. More than 500 homes were destroyed and hundreds damaged, leaving 2,000 homeless. The seaport was destroyed, and many businesses were flattened or burned. Over 1,100 vehicles were damaged and 362 freight cars were obliterated—the property damage was estimated at $100 million (equivalent to $1,100,000,000 in 2018). A 2-short-ton (1.8-metric-ton) anchor of Grandcamp was hurled 1.62 miles (2.61 km) and found in a 10-foot (3 m) crater. It now rests in a memorial park. The other main 5-short-ton (4.5-metric-ton) anchor was hurled 1⁄2 mile (800 m) to the entrance of the Texas City Dike, and rests on a "Texas-shaped" memorial at the entrance. Burning wreckage ignited everything within miles, including dozens of oil storage tanks and chemical tanks. The nearby city of Galveston, Texas, was covered with an oily fog which left deposits over every exposed outdoor surface. She was born on May 11, 1875 in Arcadia Township, Manistee County, Michigan. After her family moved to San Francisco, California, in the early 1900s, she became a journalist. Harriet Quimby's public life began in 1902, when she began writing for the San Francisco Dramatic Review and also contributed to the Sunday editions of the San Francisco Chronicle and San Francisco Call. She moved to Manhattan, New York City in 1903 to work as a theater critic for Leslie's Illustrated Weekly and more than 250 of her articles were published over a nine-year period. Quimby continued to write for Leslie's even when touring with airshows, recounting her adventures in a series of articles. Totally committed to her new passion, the dedicated journalist and aviator avidly promoted the economic potential of commercial aviation and touted flying as an ideal sport for women. Quimby became interested in aviation in 1910, when she attended the Belmont Park International Aviation Tournament in Elmont, New York. There she met John Moisant, a well-known aviator and operator of a flight school, and his sister Matilde. On August 1, 1911, she took her pilot's test and became the first U.S. woman to earn an Aero Club of America aviator's certificate. Matilde Moisant soon followed and became the second. Due to the absence of any official birth certificate, many communities have claimed her over the years. After earning her license, the "Dresden China Aviatrix" or "China Doll," as the press called her because of her petite stature and fair skin, moved to capitalize on her new notoriety. Pilots could earn as much as $1,000 per performance, and prize money for a race could go as high as $10,000 or more. 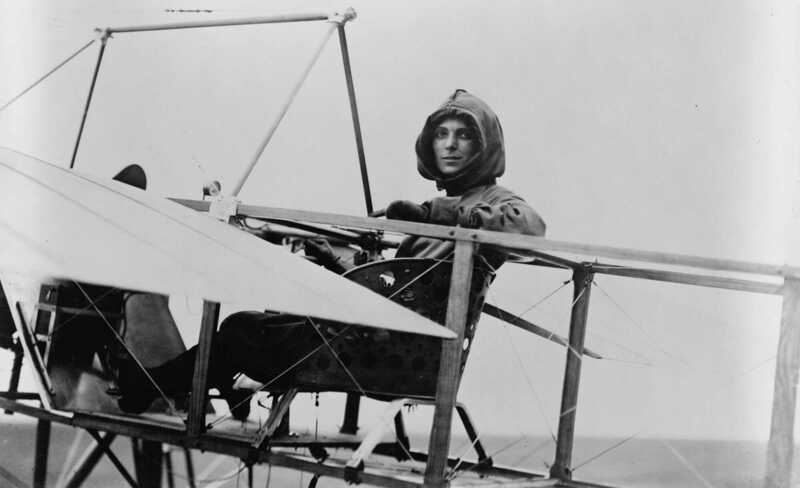 Quimby joined the Moisant International Aviators, an exhibition team, and made her professional debut, earning $1,500, in a night flight over Staten Island before a crowd of almost 20,000 spectators. As one of the country's few female pilots, she capitalized on her femininity by wearing trousers tucked into high lace boots accentuated by a plum-colored satin blouse, necklace, and antique bracelet. She drew crowds whenever she competed in cross-country meets and races. As part of the exhibition team, she showcased her talents around the United States and even went to Mexico City at the end of 1911 to participate in aviation activities held in honor of the inauguration of President Francisco Madero. On April 16, 1912, Quimby took off from Dover, England, en route to Calais, France, and made the flight in 59 minutes, landing about 25 miles (40 km) from Calais on a beach in Équihen-Plage, Pas-de-Calais. She became the first woman to pilot an aircraft across the English Channel. Her accomplishment received little media attention, however, as the sinking of the RMS Titanic the day before consumed the interest of the public and filled newspapers. On July 1, 1912, she flew in the Third Annual Boston Aviation Meet at Squantum, Massachusetts. Although she had obtained her ACA certificate to be allowed to participate in ACA events, the Boston meet was an unsanctioned contest. Quimby flew out to Boston Light in Boston Harbor at about 3,000 feet, then returned and circled the airfield. William A.P. Willard, the organizer of the event and father of the aviator Charles Willard, was a passenger in her brand-new two-seat Bleriot monoplane. At an altitude of 1,000 feet (300 m) the aircraft unexpectedly pitched forward for reasons still unknown. Both Willard and Quimby were ejected from their seats and fell to their deaths, while the plane "glided down and lodged itself in the mud". Harriet Quimby was buried in the Woodlawn Cemetery in The Bronx, New York. The following year her remains were moved to the Kensico Cemetery in Valhalla, New York. The storm was harsh due to the high winds that hit the area that day. The combination of drought, erosion, bare soil, and winds caused the dust to fly freely and at high speeds. The "black blizzards" started in the Eastern states in 1930, affecting agriculture from Maine to Arkansas. By 1934 they had reached the Great Plains, stretching from North Dakota to Texas, and from the Mississippi River Valley to the Rocky Mountains. 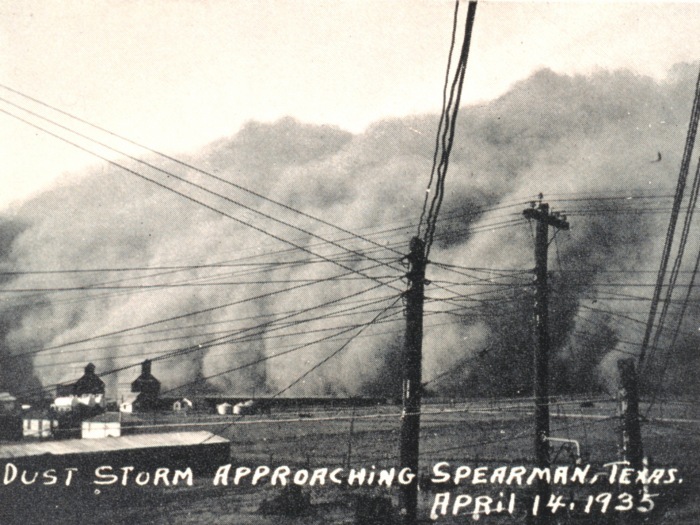 "The Dust Bowl" (as an area) received its name following the disastrous "Black Sunday" storm in April 1935, when reporter Robert E. Geiger referred to the region as "The Dust Bowl" in his account of the storm. The destruction caused by the dust storms, and especially by the storm on Black Sunday, killed multiple people and caused hundreds of thousands of people to relocate. Poor migrants from the American Southwest (known as "Okies" - though only about 20 percent were from Oklahoma) flooded California, overtaxing the state's health and employment infrastructure. Musician Kat Eggleston has written a play, The Cyclone Line, about her father Al Eggleston's experiences growing up in 1930s Oklahoma, Black Sunday, and the Dust Bowl in general. Its first public performances were on Vashon (Island), Washington, where he lived most of his life. Americana recording artist Grant Maloy Smith released an album in 2017 called Dust Bowl – American Stories that featured two songs that directly referenced Black Sunday. The song "Old Black Roller" is written from a first person perspective during the Black Sunday storm, and another song "Never Seen The Rain" has these chorus lyrics: "We worked the land to death, me and my brother | 'Til April 14, 1935 | Oklahoma, you were like our mother - oh, my"
American recording artist Gillian Welch refers to the storm and other historical events in a two-part song on her 2001 album Time (The Revelator) : "April the 14th Part I" and "Ruination Day Part II".